Pilates has come a long way over the last 10 years and probably one of the biggest changes I’ve seen is the amount of men that are now participating in classes. But there are still a lot of misconceptions about whether Pilates is a true “blokes” workout and if it can be used as way of building muscle. Well, you only have to look at the photo of Joseph Pilates above to see that it can. So where did this myth come from? Primarily from the actual Pilates Industry itself. Pilates really didn’t become mainstream until the early 1990’s…it had always been a “fringe” or alternative exercise method and as it started to expand, nobody really knew how to explain what it actually was. Back in those days the term CORE STRENGTH didn’t exist…really, that is true! So attempting to explain Pilates without using the term core strength was challenging. The only reference was the fact that dancers had been involved in Pilates since it was created, then celebrities like Madonna started to get linked to it and all of a sudden, any photo of Pilates involved a long, graceful, elegant ballerina like female. No blokes in sight!! And to be honest, when I first started Pilates back in the early 1990’s…I felt quite intimidated by all the dancers that were in my sessions who moved so beautifully. 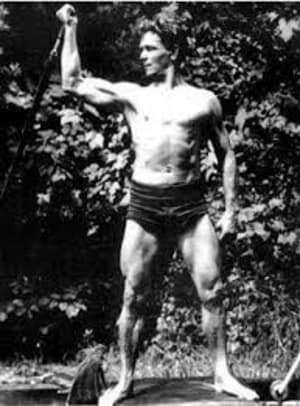 Joseph Pilates…well, was a man! And he was an athlete…not a dancer! He was a body builder, boxer, wrestler, skier, martial artist and also practiced yoga. So his background is from fitness, not dance and when you read his books, he talks a lot about the benefits of being physically fit. The fact that Pilates requires complete co-ordination of the mind with the body, has given it the reputation of being more about the mind and not the body and it then gets lumped in with other movement methods like yoga or even meditation. When you first learn Pilates, there is definitely more focus on the mind/body connection because you need to nail this aspect before you can progress. And it’s at this stage that you have to deal with any injuries or issues in your body that need rehabilitation. This stage is where you learn correct movement technique and create a body that moves with efficiency, effectiveness and strength. Then the fun begins as you get challenged with advanced Pilates exercises that flow from one to the other without a break, getting the heart rate elevated and the blood pumping!! Pilates is a workout and you need to bring your workout towel with you to your sessions. Pilates isn’t strength training, right? WRONG! In fact, one of the 34 Mat Exercises Joseph Pilates created was a push up. There are traditionally three exercises that are considered the cornerstone of any strength training program. The push-up, chin-up and squat. And the reason that these exercises are important, is because they are fundamental movements we perform every day without realising it. So, any exercise program should include them. Pilates is no different from any other exercise method, it’s just that the squat, push-up and chin-up get the Pilates treatment. What does that mean? It means precise technique, driving the exercise from your core, understanding what it is you are trying to achieve by doing the exercises, not just getting quads of steel and guns, (although there is nothing wrong with quads of steel and guns! ), but not missing the opportunity to lengthen your muscles and spine at the same time. When you do strength training this way…it adds to the health and longevity of your spine, at the same time as adding to your strength and power…BONUS!! OK, this is probably one of the most perplexing Pilates “Men Myths” out there. Because it’s usually men making the comment…and it’s usually men who are in strife with their flexibility and mobility. What if there was a way for you to lengthen your muscles and create great mobility in all of your joints, including your spine…while you were doing your strength training! That’s called Pilates! One of the major Pilates movement principles we work with, is to create length in the muscles but strength through the full range of movement as well. It’s absolutely impossible for your body to have functional movement with tight and stiff muscles and joints. This is a biomechanical fact and is true, regardless of the type of exercise you are participating in. Pilates also creates flexibility by addressing the imbalances in the body that have led to tightness and stiffness, usually from postural issues. Some muscles become very weak, while other muscles have to over work to compensate, and they get tired and tight and generally get quite grisly. So is there stretching in Pilates? Yes, but it’s probably not what you think it is and as I say to my clients…you have to work for your stretch.